If you’re looking for a light-hearted escape from the recent wave of super hero movies where even the good guys get killed, Marvel Cinematic Universe has a lovely summer surprise with Ant-Man and the Wasp. This is the most fun I’ve had at the movies all year. Our diminutive hero Scott Lang (Paul Rudd) has been confined to house arrest following his actions as Ant-Man in “Captain America: Civil War.” No longer able to help save the planet, he focuses on trying to be a better father to daughter Cassie (Abby Ryder Fortson), although he only sees her on occasional visits. 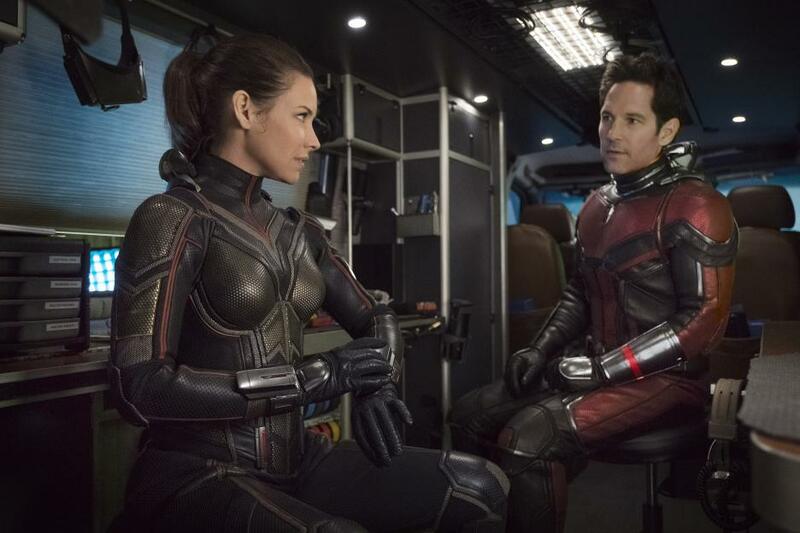 Just a few days before his sentence is due to end, Hope van Dyne and Dr. Hank Pym (Evangeline Lilly and Michael Douglas) kidnap him for an urgent mission. They have built an amazing laboratory that can be shrunk to the size of a suitcase for easy transporting; plus they may have found a way to rescue Dr. Pym’s lost-in-space wife and fellow scientist, Janet van Dyne. The main baddy is Sonny Burch (Walton Goggins), who wants to get his hands on the shrinking lab, whatever it takes. Ghost (Hannah John-Kamen) an interesting new character who can walk through dimensions, also needs to find that lab. That’s the plot in a nutshell, but it’s made even more fun by the bantering between Rudd and Lilly as they take on a variety of villains, uncover past secrets, and change sizes in a nano-second. Lang’s business partner Luis (Michael Pena) adds to the fun, stealing any scene he’s in—and he’s in quite a few. Walt Disney Pictures Ant-Man and The Wasp is a sci-fi action/adventure/comedy film rated PG-13, directed by Peyton Reed and written by Andrew Barrer and Gabriel Ferrari. It opens wide July 6 and runs 118 minutes. As most Marvel Universe fans know by now, don’t leave until the final credits roll. There is a surprise twist coming after the credits, which obviously sets up a sequel. Since this latest sequel was even funnier than the first Ant-Man, that is very good news.